Daniel was little he used to daydream about fantastic imaginary worlds. He would draw monsters, invent stories about magical items, or role-play with friends. Now he brings his art to life with stories from a distant parallel Steampunk universe. He uses his creations to share his passion for the world of Steampunk with the rest of us . 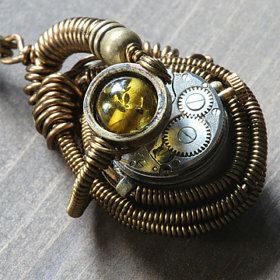 My Mission is to Offer One of a Kind original Steampunk jewelry designs and share a part of my imagination with you.